This is currently where Mozilla Firefox is going, and they've released a public preview of where they believe the web will be when they release it. The main drawbacks of installing this are definitely the lack of plugin/extension support and coming across possible bugs. You can install this version in parallel to other versions of Firefox (I'm running 4.x). Version 59.0 is a freeware program which does not have restrictions and it's free so it doesn't cost anything. 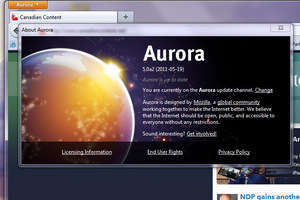 For security reasons, you should also check out the Firefox Aurora Beta download at LO4D.com which includes virus and malware tests. Additional screenshots of this application download may be available, too. Firefox Aurora Beta has a presence on social networks.